It’s out as part of an exciting new collection, Comparing Post-Socialist Transformations: Purposes, policies, and practices in education, edited by Maia Chankseliani and Iveta Silova. Our chapter compares how Estonia and Kazakhstan are using their two flagship universities – the University of Tartu and Nazarbayev University – as tools in their broader quest to find a place towards the top of the global hierarchy of nations with high quality (and top ranking) universities. Why compare Estonia and Kazakhstan? Apart from the obvious sharing of 20th century educational and political history as republics of the USSR, both states have in recent decades been investing heavily in higher education reforms. They do this in their effort to transform into the much desired ‘knowledge economy’, which is basically a global panacea for all countries’ educational and labour market problems. Adding a really interesting dimension to the comparison is the historical differences between the two countries and universities we examined. Estonia was a nation-state well before being annexed by the Soviet Union in 1940, and the the University of Tartu is one of the oldest universities in the European model, having been founded in 1632. That makes it older than any university in the United States which has a plethora of institutions in the global rankings. At the other geographical end of the former Soviet space, Kazakhstan became an independent state only after the fall of the Soviet Union in 1991. It does have a deep and rich history, just not in the geographic and political formation it inherited last century. Our case study Nazarbayev University is an archetypal creation of contemporary Kazakhstan, teaching in English, recruiting academics from around the world and rapidly expanding after admitting its first students in 2010. To make our comparison, we used the theoretical idea of international legitimacy building. This is a dynamic process in which actors – in our case, the governments of Estonia and Kazakhstan and the two universities – discover, shape, adopt and diffuse ideas or sets of norms with the aim of enhancing their global standing. Having a top university is one symbol of being a highly ranked nation, which is why we focused in on the flagship university in each state. Going through the four phases of international legitimacy building, we found both patterns and divergences between the two countries. For example, strong leadership from the top in steering higher education was found in both settings, as were a series of rapid reforms to higher education made as soon as economically possible after 1991. The clearest distinction between the two states was the much greater agency of higher education institutions in Estonia than their counterparts in Kazakhstan, where persistent centralization has only very recently started to shift towards offering universities greater autonomy. It’s never enough to say that your study is important because it is the first of its kind (although it is true that this is the first comparison of national/higher education developments in Estonia and Kazakhstan and we are pretty excited about having done this!). We believe the chapter makes a contribution in the understanding and analysis of processes of state formation in the post-socialist space – states that are (re-)forming under intense global pressures not experienced by other countries that came into existence in the mid-20th century or earlier. We have also used our study to raise the important question of ‘what happens next’ for states like Estonia and Kazakhstan that choose to adopt dominant global discourses. Can they get their heads above the parapets and get the universities into a global top 100 ranking? Will they have to change their systems completely to achieve what they see as ‘global best practice’? Or is there a way in which Estonia and Kazakhstan can use this global discourse to enable their universities to flourish as global players on their own terms? Tamtik, Merli, and Emma Sabzalieva. 2018. “Emerging Global Players? Building International Legitimacy in Universities in Estonia and Kazakhstan.” In Comparing Post-Socialist Transformations: Education in Eastern Europe and Former Soviet Union, edited by Maia Chankseliani and Iveta Silova, 127–45. Oxford: Symposium Books. Under copyright rules, I am not allowed to freely distribute our chapter. Sorry. But if you are based at a university or college, would you encourage your library to stock a copy? Thank you to Max Antony-Newman for requesting a copy for the University of Toronto library already! Alternatively, if you would like to buy a copy, I can help you get one with an extremely respectable 50% author discount. Please drop me a note to follow up. This entry was posted in Kazakhstan and tagged Estonia, Iveta Silova, Kazakhstan, legitimacy, legitimacy building, Maia Chankseliani, Merli Tamtik, nation building, Nazarbayev University, post-socialist, universities, University of Tartu, university rankings. No problem, cat meme! Just visit the Ideas on Europe blog! We live in an era of intense and growing international connections, but also in a world of significant positional differences between localities, states and regions. In this context, how can the idea of the world-class university be used by states to survive and succeed? What does this idea look like in states that are outside of the European and North American “core”? These are the questions I explore in a post published today, 5 February 2018, on the Europe of Knowledge blog. Please head over to http://era.ideasoneurope.eu/2018/02/05/shaping-idea-world-class-university-outside-global-core/ to read the full article. The Europe of Knowledge blog is the official blog for ECPR Standing Group on the Politics of Higher Education, Research, and Innovation. As the website explain, this Standing Group brings together scholars whose work relates to the deeply interconnected fields of higher education, research, and innovation to encourage debates and research on the politics and policies in these areas. The aim of the blog is to communicate scholars’ research findings to the wider international, academic and policy communities. Many thanks to Dr Inga Ulnicane-Ozolina for the invitation to write for this blog, and to Jane Wolfson for stellar editorial support. This entry was posted in Kazakhstan and tagged astana, global core, globalization, globalization of higher education, Higher education, Kazakhstan, Nazarbayev University, periphery, universities, World-class university. News has emerged of a number of connected protests in / relating to Tajikistan. However, if at first glance this appears to be a tiny step towards practicing the freedoms (of speech, to gather in public etc) nominally guaranteed to citizens under Tajik law, don’t get your hopes up. Leading the story on 23 September, Radio Free Europe/Radio Liberty made its views clear through the quote marks employed in its headline: “‘Volunteers’ burned a portrait of Muhiddin Kabiri” [ru]. For context: Muhiddin Kabiri is the leader of the now-banned Islamic Renaissance Party of Tajikistan (IRPT), once the only opposition party (and the only legal Islamic party in Central Asia) and now the subject of multiple extremely worrying attempts to suppress its members. The IRPT is not by any means a fundamentalist Islamic party, Kabiri is now in exile, but his family members back in Tajikistan have not been left unaffected by the authorities. The ‘volunteers’ in question are students at the National University of Tajikistan and the Medical University of Tajikistan, both based in the capital city Dushanbe. This followed a 300-strong protest at Dushanbe’s Pedagogical Institute which claimed that the IRPT could bring Tajikistan back to war, as well as smaller groups of young activists who protested at the Organisation for Security and Cooperation in Europe’s (OSCE) Dushanbe offices. One of the university protest organisers, Asliddin Khusvaktov, claims that hundreds of students took part, which were in response to another set of protests also relating to Tajikistan. Asia-Plus reports the same story [en] with slightly different numbers. So now let’s move to Poland, the stage for the protests our students have taken issue with. Capital Warsaw is hosting the OSCE annual human rights conference, the Human Dimension Implementation Meeting. A handful of people – presumably Tajik nationals – disrupted sessions on 19 September with silent protests, wearing T-shirts showing the faces of opposition figures (politicians and lawyers) who who have been arrested by the state. Apparently this has led to repercussions for the families of those protestors [en], in a depressingly familiar cycle from the Tajik state. You choose to protest? We choose to pressure you: either you directly, or your family members, or similar. The student groups who led the protests in Dushanbe are mainly part of an organisation called “Avant Garde” [ru], set up by the government in 2015 to to prevent the spread of extremist ideas amongst young people. This is how Tajikistan does youth policy. You can only wonder how long the government can maintain this level of oppression in a world where internet access is increasing (and those who are caught behind frequent government bans on websites are able to find alternative ways to access sites that are targeted such as Facebook and YouTube) and where it is easier than ever – albeit with some cash and resources – to travel out of the country. And yet there are no immediate signs that change is on the horizon, protests or no protests. This entry was posted in Tajikistan, Uncategorized and tagged IRPT, Islamic Renaissance Party Tajikistan, Muhammad Kabiri, opposition, OSCE, protests, state crackdown, student protests, Tajikistan, universities, youth policy. How do you catch the attention of a global audience increasingly used to high participation in higher education? In the case of Kazakhstan, one journalist thinks he’s found the answer, and that is to showcase the high stakes risks some people will take just to have the chance to compete for a place at one of the country’s universities. The language might be a little overblown, but Naubet Bisenov’s article is otherwise an excellent entry point into the world of Kazakhstan’s wannabe student population. The startling fact that is hidden amidst the moral panics created is the very fact that so many young people are so keen to continue their education. Without unpacking the many reasons that this might be the case, I think that makes for quite a different yet nonetheless extremely compelling story in itself! His article from Intellinews is reproduced below in full. The al-Farabi Kazakh National University in Almaty is the country’s only entrant in the QS World University Rankings’ world’s top 300 universities. Kazakh authorities are resorting to desperate measures to stem the endemic cheating at school final examinations. The tests will be conducted in 166 specially-equipped testing centres between June 2 and 16 to which would-be students will be escorted by police. In order to “ensure necessary security measures” the centres will be equipped with 1,399 jammers of mobile communications, 438 metal detectors and over 2,500 security cameras. Under pressure to pass the multiple choice test, in addition to memorising answers to test problems and questions, school leavers often resort to all kinds of cheating – from smuggling mobile phones and cribs into testing centres, to sending imposters to sit the test. Tens of thousands of banned items are seized every year. Last year items such as mobile phones, portable radio sets, calculators and cribs were seized from 20,000 test sitters before the test and 32,000 during the test. In order to smuggle mobile phones into the testing centre through metal detectors pupils were reported to have wrapped them in aluminium foil and put in condoms or have worn a special skirt with secret compartments for hiding mobiles and cribs. The most controversial case of cheating last year was a third-year male student from Almaty who disguised himself as a girl to allegedly sit the test for his “girlfriend” in South Kazakhstan Region. However, later the police established that the 20-year-old man had not even known the girl but was asked by his friends to do the trick. If found guilty, the trickster was expected to face a fine worth about KZT400,000 (about €2,000 at the time), but prosecutors said they hadn’t brought charges against the man. The case, which the Education and Science Minister dubbed the “zest” of last year’s university admission season, is symptomatic of the corrupt university admission system: in 2015, the National Security Service uncovered 18 imposters in Almaty Region alone who reportedly offered to sit the test to desperate hopefuls for rewards ranging between $2,500 and $3,000. Examinations in Kazakhstan are so fiercely competitive because of the shortage of university places paid for by the government, especially at the more prestigious, and often more expensive, colleges such as Nazarbayev University and Eurasian National University in Astana, and Kazakh-British Technical University, Kazakh National University and Kimep university in Almaty. Moreover, the Soviet-era practice of requiring specific diplomas for specific jobs, means that in order to qualify for better positions Kazakh citizens must go to a university to receive the appropriate diplomas. But at the same time, the performance of Kazakhstan’s schools and universities are still well below that of Western Europe or even Russia. According to the OECD’s Pisa (Programme for International Assessment) tests of schoolchildren in 2012, Kazakhstan ranked 49th against the UK at 26th, the US at 36th and Russia at 34th, with the score for maths at 432 (the UK at 494, the US at 481 and Russia at 482), for reading at 393 (the UK 499, the US 498 and Russia at 475) and science at 435 (the UK at 514, the US at 497 and Russia at 486). In university education not a single Kazakh university was ranked among the world’s 800 top universities by the Times Higher Education World University Rankings 2015-2016. 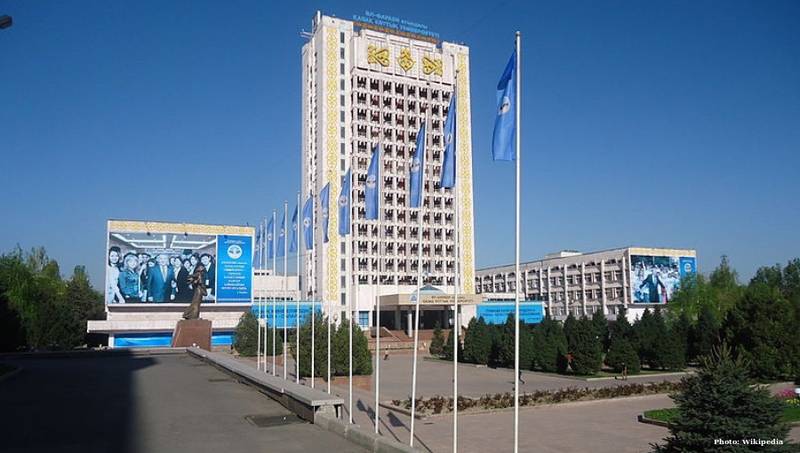 In QS World University Rankings 2015-2016, there are only two Kazakh universities in the top 400: the Almaty-based Kazakh National University at 275th place and Astana-based Eurasian National University at 371st. Next year the exam season could be even more competitive because the Kazakh government has cut the number of student grants that will be given to those enrolling in universities. The government set the number of student grants to be offered to university hopefuls at 31,700 grants in the next academic year against 32,788 grants this academic year. The decrease in the number of student grants to cover tuition averaging KZT346,000 (€927) is explained by the lower number of school leavers this year – 121,091, with 86,991 taking part in the test, compared to 124,346 and 87,783 in the previous academic year. The number of school leavers reflects a decrease in the birth rate in the country in the 1990s as a result of the economic crisis caused by the breakup of the USSR: it gradually decreased from 22.2 per 100,000 people in 1990 to 14.80 in 1998 and 14.47 in 1999 but started increasing from 14.90 in 2000 to 22.73 per 100,000 people in 2015. This will eventually translate into an increase in the number of school leavers in the near future. The government also plans to change the current system that combines school leaving exams with university entrance ones in a single test, in order to reduce stress Kazakh university hopefuls endure in the summer after finishing school. School leavers will now sit two exams – one to leave school and another to enter university. Critics says the current system puts too much pressure on pupils who need to score at least 50 out of 125 in the five-subject 3.5-hour-long test to enrol to university as tuition paying students, 55 to medical universities and 70 to prestigious national universities. Whether qualified students receive grants or not depends on the number of grants allocated for particular specialisations and the number of hopefuls who apply for them. This year for the first time, the government will allow those who fail to score the minimum to resit the test for a fee of KZT2,242 (€6). The average score was 79.4 in 2015, 2.5 points higher than in the previous year, with 14,420 scoring over 100 (17.4% of all test sitters) and five girls scoring 125 out of 125. The share of those failing the test was 18.6% in 2015 against 23.1% in 2014. This entry was posted in Kazakhstan, Uncategorized and tagged admission to higher education, corruption, exams, Kazakhstan, universities.